Grandfather of Peter Hasselbacher/Hazelbaker of America. Below is one page from a number of copies of very old documents shown to me in the Neumühle of Burghaslach. I do not know how the documents came into posession of the current occupants. It stood out from the rest because it was more readable, but also because the name Georg Lang leaped off the page. It is dated 29 December 1735. Cousin Dieter confirmed that it is a list of debts. Money would be denoted by 60 Kreuser to the Guilder. If the amounts below are added up, they total correctly to 302 Guilden and 6 Kreuzer. (A Kreuz is a cross.) A Guilder is a lot of money. 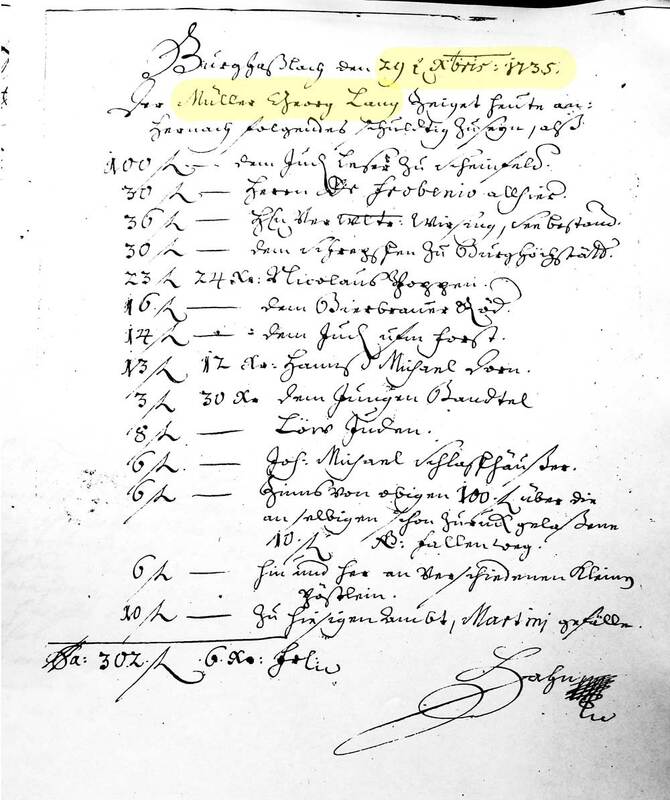 You can get a sense of how long a man would have to work to earn these sums from payments made to Johan Georg Hasselbacher and his son Balthasar for work in Münchsteinach. I suspect the date is significant because 1735 is also the year that Johann Paul Hassselbacher left Burghaslach and moved to Rehweiler. I fear that the Neumüller Georg Lang lost possetion of the mill. Born in 1694, he would have been 41. I have no information about when he might have died but a researcher looking through the Burghaslach books did not report a death record there. Georg continued to have children in Burghaslach until at least 1738. Burghaslach the 29th of December 1735. Here is an older document from May 1691. This one was largely impentrable to me. I did recognize the names Hans and Sohn (son) Adam Lang. Cousin Dieter and my German teacher were able to provide a sense of what it deals with but it was tough for them too. 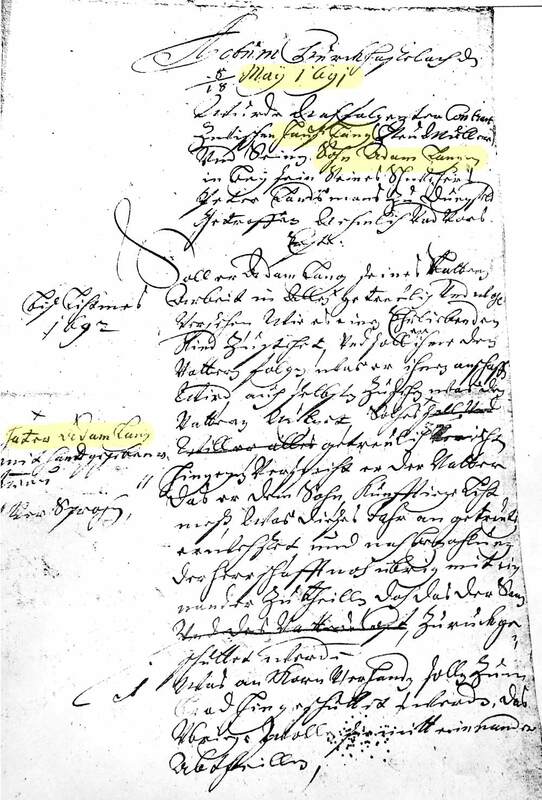 It is a contract for work between Hans (Johannes) Lang and a son Adam. (Recall that Hans is the name of the father of Georg Lang.) It is possible that Adam has a brother-in-law or father-in-law in Düngfeld (today Thüngfeld, a place by Schlüsselfeld, a few Kilometers north of Burghaslach). If someone else wants to tackle these , I will be glad to send you full resolution images of all the documents!